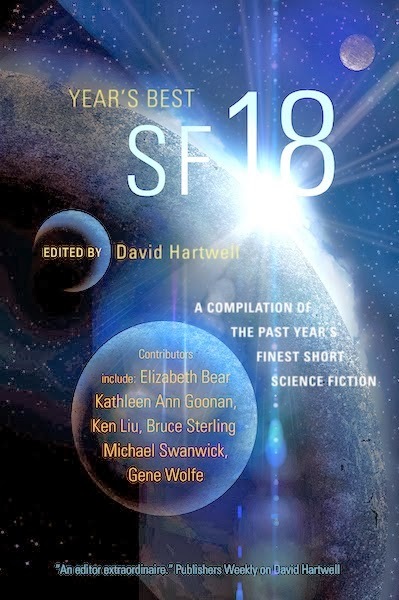 Just arrived in the post, a handsome hardback edition of The Year's Best SF 18, an anthology edited by David Hartwell. Twenty-eight stories selected from 2012's harvest, including one of mine, 'Antarctica Starts Here.' As always, a nice tick mark. Stories sometimes arrive unexpectedly; sometimes they are the confluence of several sources. This one came out of my interest in life in Antarctica, the multinational bazaar of Hong Kong's Chungking Mansions, and speculation about climate change and exploring what might happen if civilisation moves in on Antarctica. But the story is really about a couple of restless tourist guides, Dan and Krish. Dan is an old-fashioned romantic with a deep admiration for the early Antarctic explorers; Krish is a pragmatic who has adapted to the new reality of the slowly thawing southern continent; a discovery in the new landscapes of the Antarctic Peninsula underscores their differences and puts their friendship to the test. After the global celebrations of an arbitrary point in the planet's orbit, a solipsistic entry about 2013 and me. The big news as far as I'm concerned is that it's another year in which I didn't die of cancer. After being diagnosed with and being treated for cancer in 2010 I remain in remission. Three years on, after it didn't look like I'd outlive Margaret Thatcher, I'm grateful that I'm still here, still able to work, and still being published. I'm able to write this because of the intervention of the National Health Service, which was there when I needed it and provided - is still providing - care that's free at the point of demand. But for how much longer? Margaret Thatcher began to privatise public utilities and sell off public housing; her successor, John Major, privatised the railway system; the present government shows every sign of wanting to break up the NHS and privatise the profitable bits. And in 2013 it revealed that the so-called austerity measures that have impoverished the poor and disabled and disadvantaged are driven not so much by contingency but by ideology. When the present financial crisis ends, the government plans to continue to cut back public services and sell off the commons to multinational companies that offshore profits. Meanwhile, across the world, the richest 1% continues to accumulate wealth at the expense of the rest of us. The neofeudal society that backgrounded my Quiet War novels seems closer than ever. The civil war in Syria, the NSA's hydra-headed snooping, extreme weather events and the ongoing sixth extinction ... Life in the early Anthropocene isn't getting any easier. But hey, there were some good stories of human resilience and generosity, too. An astronaut aboard the International Space Agency had a hit with an old David Bowie song. The Curiosity rover discovered that Mars once harboured conditions suitable for life as we know it; the Hubble telescope captured evidence that Jupiter's moon Europa is blasting plumes of water ice into space, hinting at the vast ocean beneath its icy shell; the Voyager 1 spacecraft reached interstellar space; the Chinese space agency delivered a lander and a rover to the surface of the Moon. The things we can do. Apart from trips to Italy, where I was one of the guests of honour at DEEPCON 15, and to the Celsius 232 SF & Fantasy Festival in Avilés, Spain, I mostly hunkered down in my office and wrote. PS Publishing produced a collection of stories, A Very British History, from the past twenty-five years or so of my career. There's also a signed, slipcased limited edition with extra stories and artwork. Both are fine fat handsome books. In the early part of the year, I worked on revisions of three previously produced novels, Child of the River, Ancients of Days, and Shrine of Stars, that form the Confluence trilogy. Copy editing and proof reading have been done; the rebooted trilogy will be published in an omnibus volume with two associated stories in February 2014. I also completed the last novel in the Quiet War sequence, Evening's Empires, which was published in September, and self-published a collection of previously published Quiet War stories and some new vignettes as a Kindle ebook, Life After Wartime. It's a nice way of giving new life to stories, this self-publishing business, and kind of fun, even though the learning curve is pretty steep. I'm planning to republish at least one novel as an ebook next year, but first need to find someone to do the heavy lifting of coding and publishing ebook on platforms other than Kindle. I wrote a couple of short stories, too. One will be published in Old Venus, an anthology edited by Gardner Dozois and George R.R. Martin; the other is my contribution to the third in a series of portmanteau books about a global zombie war, edited by Stephen Jones. Oh, and my short story 'Transitional Forms' was published in the anthology Twelve Tomorrows, a special edition of MIT Technology Review. I started developing the Quiet War sequence with a short story, 'Second Skin', which appeared in Asimov's Science Fiction way back in 1997. It's been a long road to Evening's Empires, and now it's time to take a new direction. Well, newish. This year, I signed a new contract with Gollancz for two novels that share the setting I've begun to explore with several short stories in the Jackaroo series, about the effect on humanity of the arrival of playfully enigmatic aliens. I'm presently scribbling revisions on the penultimate chapters of the first novel, Something Coming Through. I'll finish it early next year, and then get straight down to writing the second, Into Everywhere. I'm not one for New Year's resolutions. As usual, I hope to read more books, and find ways of improving my own work. As usual, I'll probably fail at the latter, but hopefully I'll fail in interesting ways.